Our support team will be sending out an email with your tracking codes after the watches have been delivered. Alternatively, you can input your email here to get your tracking information (This only works after tracking information is made available by the courier). Finally, to celebrate our backers receiving their watches all over the world, we’re launching a Global Facebook PHOTOGRAPHY CONTEST! 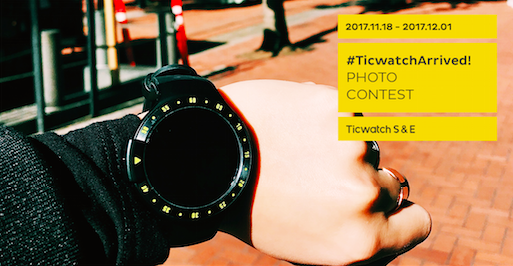 Simply take a creative photo of your watch and hashtag #TicwatchArrived! The photo with the most likes (daily) will win $200 in cash! We’ll be posting contest guidelines very soon on our Facebook page - keep your eyes peeled!! Last edited by samfong on Fri Nov 17, 2017 6:27 am, edited 1 time in total. The tracking information needs to be updated by the shipping company first, before you can use the link to search your email. This process will take a day or two, but we assure you that your watches have been shipped out and are on their way to your homes! Thank you for this valuable information, any idea about GATI carriers for Shipping to India . Did they shipped already ? When they will update with tracking no. really excitng news indeed. Currently the link seems to be functional only on the Kickstarter page. Will this option work for preorders as well or does this concern backers only at this point ? Waiting for the shipment confirmation so that I can start tracking it! Right now, it's only available for our KS backers as their watches have already been shipped. For pre-orders, we'll be sending out tracking codes via emails once they're ready! WTF, Your shipment hasn't even started. But you're already selling S&E at Amazon at lower prices. How can I cancel my order????? ?